As a fan of different music genres and theories, it’s always a treat to come across a really nice streaming service that answers my needs, music selection and overall design considered. When I first heard of Tidal years back, I didn’t really consider it an option. First, it’s not available in the Philippines, second, I wasn’t a fan of Jay-Z (who owns the company), and third, I had heard reports about it being expensive as hell. More than Apple Music & Spotify combined, in fact. Converted to Philippine Peso, the base monthly plan starts at P522 and gets up to P1,044 for the HiFi subscription. (That would already pay for a Family Plan on any of the other streaming platforms!) Being the sucker that I am for new things, I caved and got the HiFi plan (‘cause why not?). The iPhone app is also very beautiful, with no distractions at all when you pull out a track into full-screen mode. Very sleek. I also love that it took me less than 5 minutes to set things up just the way I wanted. From “collecting” albums to creating playlists, the experience was smooth. Their claim to provide lossless audio for HiFi accounts was accurate. There was a period where, to test the quality across the three platforms (Tidal, Spotify, Apple Music), I’d play the same song on the fullest, highest settings available on all of them. To give the two a fair chance, I temporarily set Tidal to play at Standard quality. Tidal came out a tad bit better. More bass and a fuller sound. Just like the other platforms, you can save songs for offline listening via the app and all the nice features you expect to come with the service. Unlike Spotify, they have videos that you can save to collections - kind of like a personal video playlist. They also house music-themed podcasts, which i also like. So, Tidal is great. I never said it was perfect, however. For one, the desktop version of the app doesn’t allow downloads for offline listening. I’ve tried exploring the interface but I haven’t found a way to do that. While that disappointed me, it wasn’t a deal breaker. 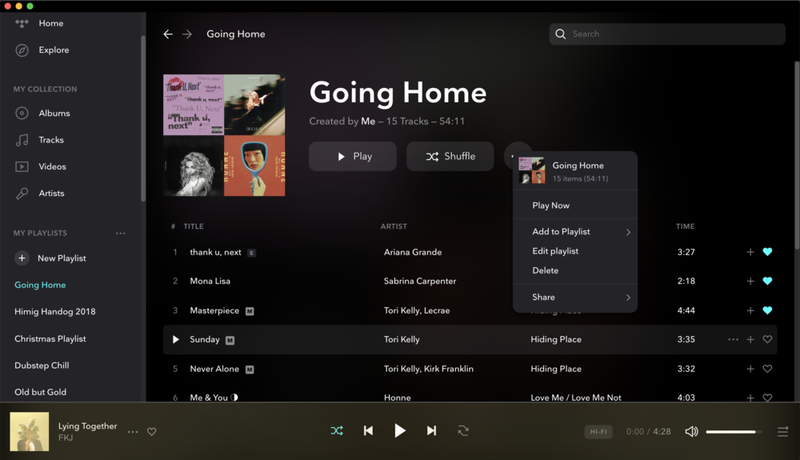 Desktop app for Tidal. Can’t see a download button anywhere. Secondly, I was hoping that their podcast directory wouldn’t be music-based only. One of the things I love about Spotify and Apple Music is that there’s a huge selection of podcasts ranging from music, to self-improvement, to language learning, and more. Thirdly, their global music selection is incomplete. Similar to Spotify, not all K-Pop or J-Pop tracks are listed. Apple Music has an advantage here, but also, the platform isn’t complete in itself. Considering all these pro’s and con’s, I’d still recommend Tidal. It has more of what I love than hate, I love how it looks, I love its simple interface, and I’d be willing to give it more money on my next annual bill. 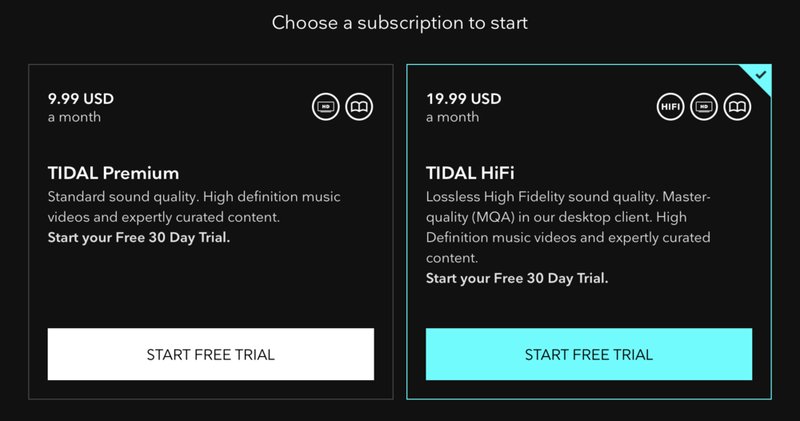 Have you ever tried Tidal or thinking of getting a trial subscription? Sound-off in the comments! I’d love to hear your thoughts. Bye! As an artist, nothing makes me happier than finding new ways to create, most especially if that 'way' concerns technology and Apple (pretty biased, as I'm sure you all know about me by now). Well, let's just say I was given another toy to play with. The Ipad Pro was given as a one year marker by my boss (our company's 'culture' of getting supplied with gadgets or getting an upgrade every year as needed), and as the new Ipad is geared towards creatives - with the Apple Pencil and applications meant to be used alongside it - he decided I needed one for work (and play, obviously). 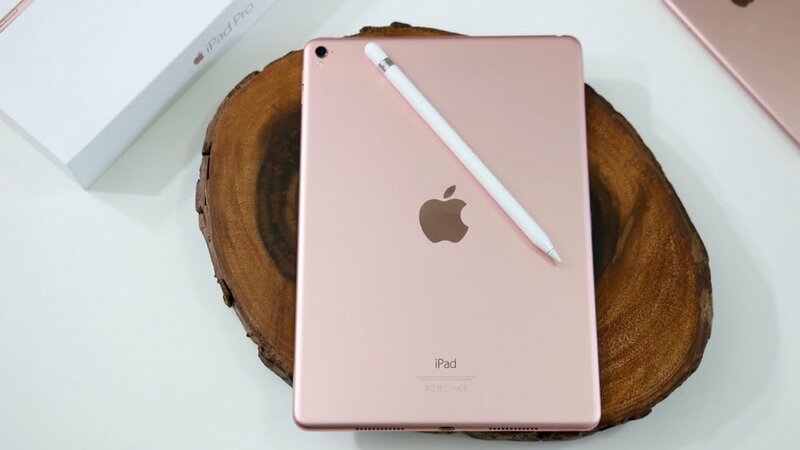 After one month, here is what I think about the Ipad Pro 9.7 in Rose Gold, with the Apple Pencil. The Ipad Pro, when it was announced last year, became "the item" I wanted most for design purposes. Though I already owned a Wacom, I wanted to get one because I'd be able to design on-the-go, take notes using the pen, and others. More than anything, I wanted to try out Procreate, a premium design/drawing app Apple had featured at the forefront. It held promise during the keynote with the added functionalities (like the 4 speakers, true tone display, nightshift), and I just had to experience using one. This isn't a long list, but it's a huge deal for me. Everyone I've worked with knows that Photoshop is my lifetime partner (hehe) and that my Wacom is my soulmate. When it came to working my "magic" in designing whatever, these two were all I needed. In the wake of the Apple Pencil-Ipad Pro generation, I found myself relying less and less on those two as time went by. Now, if I needed to create a digital painting or sketch/doodle, I'd reach for the Apple Pencil and Ipad. If I needed to create a poster or business card (among others), I'd also reach for them. Last week, I actually noticed that my Wacom GT had been sitting inside my desk drawer at the office for quite a while. Aside from those, I've become more comfortable taking notes digitally compared to before when I still had to use my mac to record meetings and other instant ideas. It is now a habit to attend weekly office meetings with the Ipad Pro and Pencil in hand. It's also great that I can project my screen onto the widescreen TV at work using Airplay with no hassle at all. The Ipad Pro is worthy of investment - thanks to the Apple Pencil. The Ipad Pro would just be a regular Ipad without it, even if it had true tone and 3D touch. If it weren't for the Apple Pencil, I wouldn't be bothered - even if it was in Rose Gold. There are downsides and limitations to this setup though (duh). For one, Procreate is good for replacing the software I mentioned above, but in terms of creating vector art or graphics, I'm still looking for an app that will give me the same features as Illustrator or Autodesk Graphic. Even Adobe's line of apps for the Pro aren't satisfying. So for vectors, I revert to my mac and use Sketch. Also, the iMovie on the Ipad Pro is a few leagues down in comparison to the Mac's fully-powered version. What took me 5 minutes to do on the mac in terms of video editing I did for around 15, including the time spent looking for tools I normally used on the desktop app. Of course, I couldn't really expect edit videos exactly the way I wanted them on the Ipad Pro. Apps currently in my Create folder. I have Procreate separated from them since I use that app more often and I need quick access whenever I want to draw or doodle something. If I had to give the Ipad Pro and Apple Pencil a percentage to define their current use for me, it would easily be a 60%. Like I said, there's less hassle working with them compared to my usual routine. In summary, my month-long journey with the Ipad Pro 9.7 has made significant change in my work flow and creation process. There's more yet to do with this pair, and I am only just beginning to scratch the surface. The video below was taken by a colleague just after I opened the package and paired the Apple Pencil. Since then, I've become more acquainted with how much pressure is needed to do script lettering, drawings, and such, so take this as a first time take on lettering using the Pencil. If you have any suggestions for what apps I should try, or questions about anything related to this gadget, tell me in the comments. I want to test this baby out to its fullest capability.